An original, hand-printed serigraph published by the artist with collaboration of master printer Brad Faine at Coriander Studio, London. I wanted to create a picture of an orchestra for many years and had made many preliminary drawings and sketches since 1972. As a child I wanted to become a musician, and I think of some of my happiest moments when I played in a community youth orchestra. While in London, 1976 through 1980, I had a chance to hear many concerts and to sketch the orchestras in the different concert halls. I had more time while in London to develop my drawing skill while sketching and also learning the etching technique. I felt more confidence to begin the task of printing a serigraph of this complex subject. 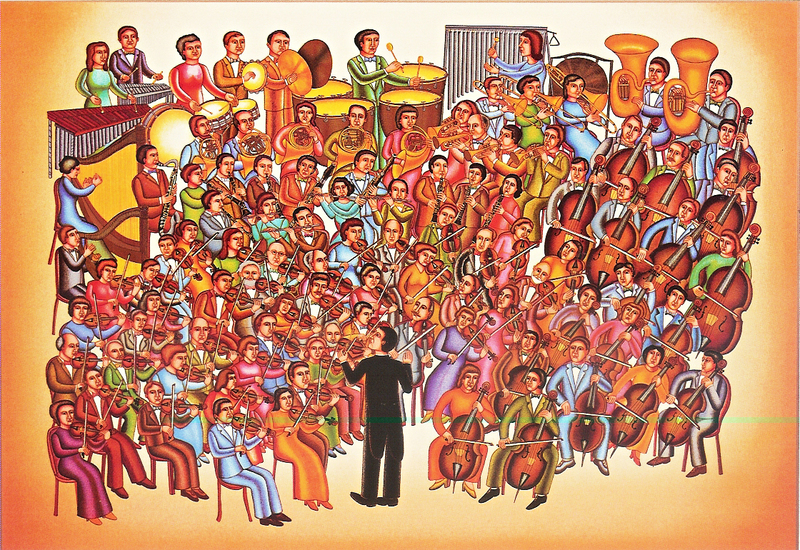 It took time to decide on the right printer to help me, since I needed to use new techniques to render the shading and modeling of each of the individual musicians in this 100-piece orchestra. The close alignment of each color printed was critical due to the importance of each overlay stencil role in defining and solidifying the musicians and their detailed instruments. The printer, Brad Faine, of Coriander Studio, London, worked very closely with me for over six months, together we were able to achieve some very difficult feats of printing. The formality of the orchestra was achieved by the use of a sculptural technique, influenced by the feeling of Orthodox Icons of Russia and Bulgaria. Attention to the detail of each individual, his face, and musical instrument was developed by observation of the large collections of Islamic and Medieval miniatures available in the Museums and galleries in London.